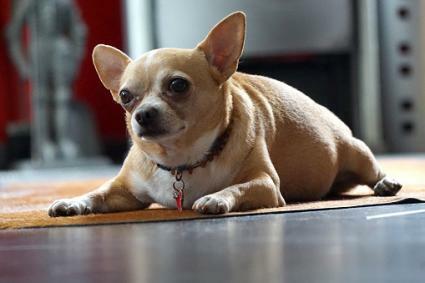 A diabetic dog struggles to control his blood sugar levels. Insulin injections are a crucial part of therapy, but diet also plays an important role. Just as human diabetics must cross certain goodies off the menu, so a canine diabetic should eat a carefully controlled diet. VCA Hospitals explains that diabetes mellitus (also known as sugar diabetes) is a medical condition where the dog has persistently raised blood glucose levels. This is because of either an underproduction of insulin by beta cells in the pancreas or an inability of target cells to recognize insulin. If you notice any of these signs, consult a vet. Prompt treatment is important and can be life-saving. Another aspect of feeding is to avoid overfeeding, as obesity decreases the ability of the body's cells to react to insulin. Take your vet's advice on your dog's ideal body weight and work toward this goal. The American Journal of Veterinary Research has found that when feeding a commercial food, dry kibble or canned foods are best. Semi-moist foods are best avoided as these contain large amounts of simple sugars which can make diabetes control difficult. 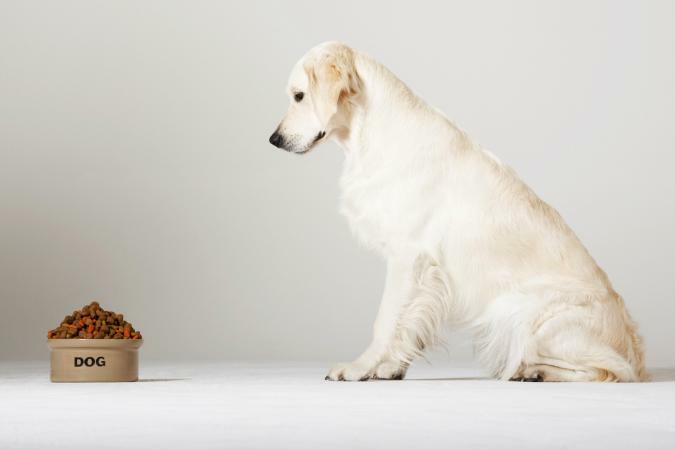 Pet Education explains how a balanced, home-prepared diet is deceptively hard to prepare. For healthy dogs, this is in part because any dietary deficiencies may not show up for months or years. In diabetic dogs, the price of a poorly thought-through diet is instability with the risk of complications such as a ketosis or coma. Owners of diabetics have a double hurdle to clear when preparing a home-made diet. They must provide a food that's consistent in calories and sugar release, while still providing a balanced diet. However, balance is achieved through feeding a variety of ingredients which creates a dilemma since diabetics don't tolerate change. On the whole, a feeding prescription diet designed for diabetic dogs is advisable. Use consistent recipe so that the body can best process sugar peaks. Make sure the food is low in simple sugars. According to Diabetes.co.uk, these are easy to digest sugars such a glucose, sucrose, or lactose. In practical terms, this means never sweetening foods or feeding sugar-rich items (even as treats) such as cakes, cookies or sugary cereals. Sneakily, these sugars can a hidden ingredient in many manufactured human foods, or semi-moist dog foods, which makes checking the label a good habit to get into. The food should be high in unrefined complex carbohydrates in order to slow sugar absorption. This means starchy foods that are rich in fiber, such as whole grain rice, oats or vegetables. The food you prepare should be low in fat. Diabetic dogs are at risk of excessive fat in the bloodstream, so feeding a low-fat diet is essential. Your homemade diet should include small amounts of good quality meat. As you can see, creating a balanced diet does pose considerable challenges. The owner serious about homemade dog food should consult a qualified veterinary nutritionist. This is the best way to ensure an adequate, balanced diet suitable for both short and long-term health. One option to take the headache out of caring for your diabetic's nutritional needs is to feed a commercial, prescription diet. Because these are formulated to be correct for a dog with a health condition (diabetes) and may not be appropriate for other animals, they are mainly retailed through a vet. Each of the major manufacturers of prescription foods has a diabetes diet. Royal Canin is available as dry kibble or a canned diet. A 7.7 lb bag costs around $28. The formulation contains complex carbohydrates, fiber, and high-quality protein, along with reduced fat, to help control blood sugar levels. The first ingredients listed include chicken meal, barley, corn gluten and tapioca. WD relies on fiber to release sugar into the bloodstream slowly. While undoubtedly beneficial to diabetics, sites such as Dog Food Advisor questions the quality of this food. An analysis by Dog Food Advisor claims the food is plant-based with above average carbohydrate content and below average protein. However, it should be remembered that in part this reflects that prescription foods are tailored to the specific nutritional needs they are designed to meet, rather than being suitable for every dog. Purina DM is available as a dry kibble food. A 6.6 lb bag costs around $24 The first ingredients listed include dehydrated poultry protein, barley, maize and soy meal. Human diabetics are advised to avoid sweets, bread and chocolate because of the high sugar content. The same is true for doggy diabetics. When rewarding a diabetic dog, stick with pieces of fresh vegetables such as green or butter beans. While fruits such as apples are OK for an occasional treat, be aware they have a high natural sugar content. For a more satisfying chew, consider giving dehydrated meat treats. Indeed, it may be worth investing in a home dehydrator in order to have a ready supply of healthy, diabetic-friendly dog snacks. A pet parent should think of diabetic dog food as a medicine, every bit as much as insulin. Feeding a high-fiber diet that slowly releases energy makes for better diabetes control. Also, how much you feed is important. An overweight dog has more difficulty responding to insulin than a lean dog, so keep an eye on portion size. Help keep your diabetic dog healthy by watching his waistline and what he eats, so you can enjoy plenty more wags and woofs for years to come.